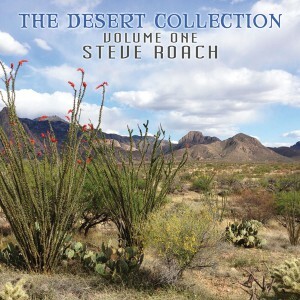 Created by Steve Roach at his Timeroom Studios throughout the Southwest across three decades. Steve writes, “Since before I was making music, I was making mix tapes (first on 8 track and then cassettes) of road music for drives through the SoCal desert and mountain backroads. The music soundtrack to these drives would somehow play to where the dynamic pieces would time out with dramatic shifts in the landscapes, most always by chance and always making the moment larger than ordinary life. I love the freedom of driving — alone in the Southwest with music. It unfurls the knotted mind and cleanses the palate for new creative thoughts to emerge over the drone of the engine mixed with a well-crafted set of music. It seems to propel the car towards the horizon as the sun sets, or rises. Countless albums have been evaluated, mapped out and road tested upon thousands upon thousands of miles over the years. It’s true to say this mix tape was 30 years in the making. The images, taken by Steve’s wife Linda Kohanov, are about 10 minutes from the where a portion of the Timeroom sits. Often Steve and Linda hike out to this area to take in the sunset, its close to home yet eons away from the things we take for granted every day. The massive rock guardian – Elephant Head – is the archetype of the Cathedral in its pure and essential form. A stone Ganesh of multi-symbolic radiance. The afternoon light upon this icon is always a marvelous spectacle. Steve Roach is a prominent musician of note working in the new-age, ambient and drone styles of electronic music, composing literally dozens of albums as both a solo artist and collaborations with others. With almost forty years of perfecting and constantly evolving his craft, this instrumental compilation, entitled The Desert Sessions – Volume One, is a superb collection drawn from four of his solo works, and the eight pieces on offer here create a sustained and seamless ambient flow. Gently soothing, hypnotic and endlessly melodic, the disc is a perfect way to relieve tensions, slowly unwind from the busyness of everyday life while still offering fascinating light progressive-electronic soundscapes for fans of the genre. Drowsy harmonica gently pierces through low-key veil-like synths in `Ghost Train’, completely devoid of any percussive elements, the piece shambling along in a lethargic intoxicating manner. `Flatlands’ is the soundtrack to your trek across great unending plains of scorched earth, wandering gentle tribal beats filled with subtle purpose urging you onwards over soothing washes of electronics. There’s a placid never-ending twinkling electronic loop weaving throughout all of `The Breathing Stone’ that reveals the world around you teeming with life. The near 18-minute `The Eternal Expanse’ is as grand and epic as its title. Synth washes lap gently at your senses, as one layer falls away, another rises to take its place over and over, dying and being reborn into eternity. They ready your mind for the inner journey to come, quickly exploding it with potential, just the smallest traces of unease threatening to overwhelm and consume. The curiously titled `The Ribbon Rails of Promise,’ another longer piece at 15 minutes, picks up the pace, a little up-tempo skittering beat patters the background with joyous and comforting tones, chiming synth shimmers and dusty harmonica darting forwards and retreating instantly. It fills the listener with a stirring hope, of discovering a way forwards through troubles and stress. `Specter’ brings a little darkness, a haunting drone of slowly ebbing synths groaning with crushing isolation and loneliness, a gradual maddening beat building the tension. The synths on another drone, `New Moon as Forbidden Mesa,’ bring an almost spectral choral quality, their lulling ethereal cries enveloping, mysterious, but never truly suffocating or menacing. `The Slow Turning’ brings light back to close the disc, a serene glistening uplifting spiritual quality that offers comforting blissful serenity.